The Navy may soon have another accolade to add to their collection: most turkeys deep-fried in one day. The Naval Academy Class of 1985 is working with Movable Mixtures, an event planning company, to try to break the record of 52 turkeys deep fried in one day on Saturday, The Annapolis Capital reported. The record-breaking attempt will take place at a tailgate near the corner of Cedar Park Road and Taylor Avenue in Annapolis before the Midshipmen’s final home football game of the season. 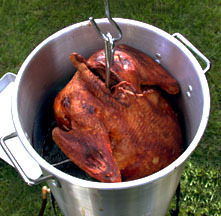 People will be deep-frying turkeys between 12:30 p.m. and 6 p.m. If you’re more interested in the game, Navy is playing Texas State at 3:30 p.m.
Want to try deep frying your own turkey this year? Instructions can be found here. Update: The Annapolis Capital reported that the alums broke the record, by deep frying 57 turkeys at the tailgate.